In response to seeing noses that appear unnatural, Dr. Zoumalan developed a set of surgical principles that are encapsulated in a rhinoplasty strategy he calls: Natural Structure Rhinoplasty. With his Natural Structure Rhinoplasty, Dr. Richard Zoumalan creates a structure that looks, feels, and breathes naturally. NATURAL: A nose that fits your face. The viewer’s attention is never distracted by aspects of your nose that appear unnatural. It looks natural, breathes naturally, and if you or someone felt it, it would not feel hard and unnatural. There are no unnatural appearing contours such as: pointy tip, up-turned nose. STRUCTURE: Creating a structure that will be stable for the course of your life. It will maintain its shape and ability to breathe through maintaining natural integrity which is found in nature. RHINOPLASTY: The delicate art of reshaping a nose to create a new NATURAL STRUCTURE. This patient underwent Rhinoplasty by Dr. Zoumalan. You can see the natural appearance of her nose in the “after” photo on the right. What makes Natural Structure Rhinoplasty unique? Natural Structure Rhinoplasty is a strategy which focuses on maintaining the nasal cartilage, bone, and soft tissue in a natural position, creating a natural contour. This creates a nose which does not look surgical. The nose fits the face. At times, the nose fits the face better than the nose which you are born with. What are the main strategic aspects of Natural Structure Rhinoplasty? Maintaining enough cartilage to prevent the nostrils from pulling up (retracting) excessively. How did Natural Structure Rhinoplasty come to be? In order to deal with this problem, Dr. Zoumalan developed a set of principles which aim to create a nose which fits the face and minimizes the chance of revision rhinoplasty for each patient. These set of principles are the basis for NATURAL STRUCTURE RHINOPLASTY. Gone are the days of an over-reduced nose which looks like it has had multiple surgeries. How does Natural Structure Rhinoplasty differ in the approach towards the septum? Natural Structure Rhinoplasty also aims to maintain as much of the septum as possible. Dr. Zoumalan maintains as much of the septum as possible.He only removes portions that are crooked beyond repair or if he needs grafts to structure the nose properly. What does Dr. Zoumalan use during the surgery that increases the natural appearance of the nose? Dr. Zoumalan uses a set of measurements of widths, angles, and distances to shape cartilage in a natural position. For difficult noses, Dr. Zoumalan uses high definition endoscopy technology to look at upper parts of the nose and ensure that there is a smooth dorsum. 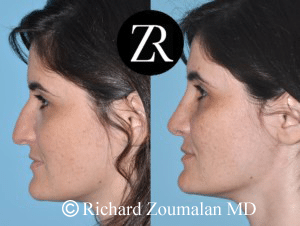 How does Dr. Zoumalan’s Natural Structure Rhinoplasty incorporate the Rapid Recovery Process? Dr. Zoumalan uses many pre- and post-operative techniques to be able to have you go out with friends or get back to work on the 6th or 7th day after surgery. Rapid Recovery Process uses a combination of dietary restrictions, herbal medication, prescription medication, and unique postoperative therapies to deal with swelling and bruising. Rapid Recovery Process is a part of Natural Structure Rhinoplasty so that abnormal scar tissue development is minimized.